There’s a certain amount of absurdity that can only be appreciated with an acquired taste and Hail, Caesar! is a comedy like no other. Directed by Joel and Ethan Coen, it’s no wonder the film is as mystifying and sharp-humored as it is. However, the film makes for unusual comedy and, depending on familiarity to the Coen brothers’ style, Hail, Caesar! may or may not be to every audience member’s taste. The film is set in the early 1950s and the film industry is in boom. When the lead actor, Baird Whitlock (George Clooney) of a film-in-progress, Hail, Caesar!, mysteriously disappears, a ransom note is delivered on the doorstep of Capitol Pictures. Eddie Mannix (Josh Brolin), head of production at Capitol Pictures, takes matters into his own hands while struggling to keep several of his actors and actresses in check. Matters worsen when an unmarried actress DeeAnna Moran (Scarlett Johansson) becomes pregnant, and Western actor Hobie Doyle (Alden Ehrenreich) struggles to adapt to his new drama role. Are the Coen brothers blowing kisses to Hollywood or condemning Hollywood? Probably both. Be it the stunning synchronized swimming routine performed by Johansson and her colorful mermaid companions or the exhilarating musical performance done by Burt Gurney (Channing Tatum) and his fellow tap dancing sailors, the Coen brothers display 1950s Hollywood behind rose-colored glasses. Still, the Coen brothers are ever ready to poke fun at the pseudo perfection they’re showing on screen. They scrutinize the dynamics of the Hollywood film industry, jeer at religious ideologies, and make the Red Scare era seem plain silly—all while maintaining a lighthearted, goofy tone. The Coen brothers’ flexible directing style should be praised in Hail, Caesar!. As far as performances go, it’s difficult to judge since the number of characters is so overwhelming. With so many characters and so few minutes, the potential of some characters are capped for the sake of others. Brolin’s performance is probably the best. Brolin delivers well-executed deadpan humor, while wholly depicting a character struggling to find meaning within his stressful Hollywood job and skewed morals. Ehrenreich’s performance follows close behind. As a singing Western sweetheart to film, Ehrenreich executes his role awkwardly, as it should be. When his character is suddenly casted in a drama film to expand his popularity, Ehrenreich’s performance as a character incapable of dropping his Southern drawl and stiff posture is hilarious, endearing, and played out perfectly on screen. As usual, Clooney does not disappoint and plays his goofy, unwise character with grace, albeit with short time. Johansson and Tatum are in a similar situation, playing their charming roles well, but having their character’s story arcs quickly resolved for the sake of time. Hail, Caesar! is a film that will have you cackling one minute and thoughtfully pondering the obvious satire the next. Those who are especially fond of the Coen brothers’ directing style will find a home in this delightful comedy. However, beware the Coen brothers’ style. The dialogue-dominated scenes, subtle humor, and oddball cinematography may throw some audience members off. 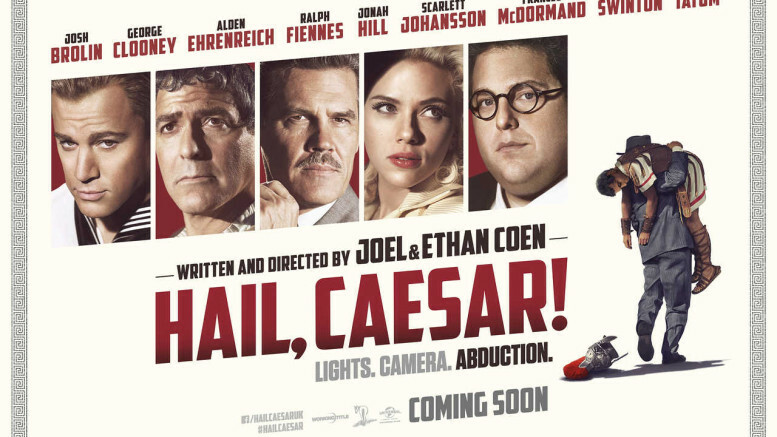 Be the first to comment on "Critics’ Corner: All ‘Hail, Caesar!’"